Multimedia browser plugin Cooliris, which lets you view photo and video content on the web in a more visually appealing manner (screencap above), has snagged $9.6 million in Series C financing from investors including Kleiner Perkins Caufield & Byers, Deutsche Telekom’s T-Venture, The Westly Group and DAG Ventures. The company has now raised a total of $27.6 million in funding. Not surprisingly, the company plans on using the new financing to further strategic partnerships and product innovation. In line with this, Cooliris is also releasing the newest version of its LiveShare group photo sharing app in conjunction with the funding announcement and the Mobile World Congress. LiveShare 1.2 allows users to discover and share content with their Facebook friends through the creation of shared group photo streams. Entering the mobile photo arena with heavy hitting contenders Instagram, PicPlz and Path, what makes LiveShare 1.2 different is that users can now organize photos by event and adjust share levels. LiveShare users can also filter photos by popularity, time, category and GPS location whether viewers are on web or mobile. 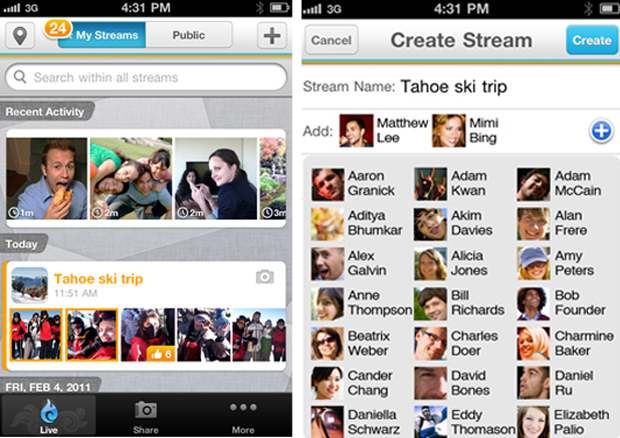 And LiveShare 1.2 is available on the iPhone, Android and Windows Phone 7. In the same sleek multimedia visualization space as Disrupt finalist Gunzoo, the Cooliris offerings run the gamut from the Cooliris browser plugin for the Desktop, to Cooliris for the iPhone, to Cooliris Express which enables publishers to easily embed the visually stunning Cooliris 3D walls, to its Discover application for the iPad and the Cooliris CoolPreviews browser add-on that allows for faster multimedia web search. Cooliris CEO Soujanya Bhumkar holds that the Cooliris 3D wall plugin (which really is impressive once you try it) has had over 35 million downloads since its initial launch and that its Liveshare Gallery application for Android has had over 100K activations since the product was released a month ago.